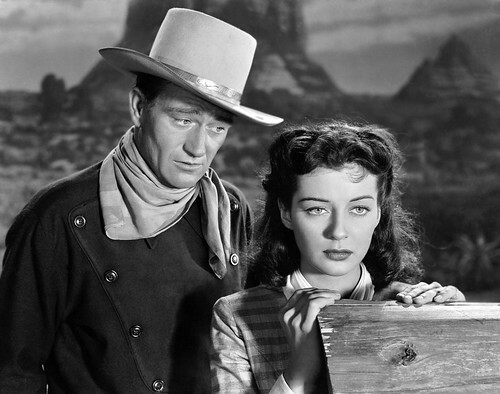 Today, we're kicking off our series on the American Western with the 1947 film The Angel and the Badman starring John Wayne and Gail Russell. The Western films made by the old Hollywood studios are some of America's greatest cultural landmarks. The cowboys and gunslingers in these films exported American ideals around the world and created an heroic myth for the nation. These seemingly simple horse operas also struggled with the darker aspects of American life, depicting the terrible treatment of American Indians and the disturbing tendency towards violence that has marked the nation. Most old Hollywood stars appeared in at least one Western -- even James Cagney and Humphrey Bogart saddled up in The Oklahoma Kid (1939) -- but some actors (John Wayne, Gary Cooper, Randolph Scott) were defined by the genre. Westerns also attracted great talent behind the camera. Foremost is director John Ford, who defined and re-invited the genre over the course of his 50-year career, but there were other great auteurs (Anthony Mann, Budd Boetticher, Delmer Daves) who put their own unique stamp on Westerns. This series will consider the best Westerns made from 1930-1970. We're kicking off the list with The Angel and the Badman (1947) directed by James Edward Grant. 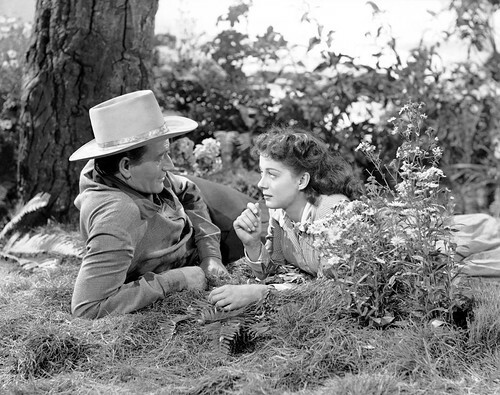 Gunslinger Quirt Evans (John Wayne) romances shy Quaker girl Penny Worth (Gail Russell) in The Angel and the Badman (1947). The Angel and the Badman is a gunslinger Western, but it is also a gentle romance between two people from different worlds. The film begins with wounded outlaw Quirt Evans (Wayne) riding onto the farm of a Quaker family, The Worths, who are trying to scratch out a hard-living on the frontier. The peace-loving Worths take Quirt in, even though their religion leads them to shun all violence. Quirt and the Worths' beautiful daughter, Penny (Gail Russell), fall in love despite their different lifestyles. Quirt attempts to settle down and become a farmer, but he cannot escape his violent past. A vintage poster for The Angel and the Badman (1947). 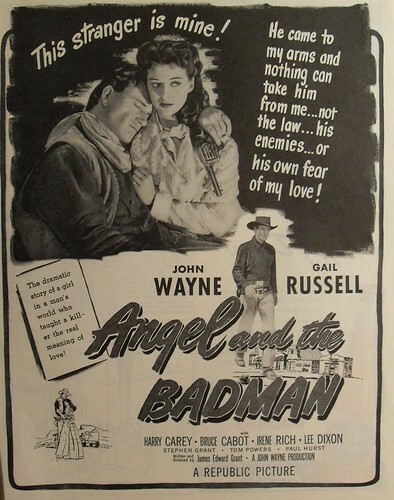 The Angel and the Badman is one of the most unusual Westerns in Wayne's filmography. It has all of the prototypes of a gunslinger film, but the movie's focus on nonviolence makes it unique. The outlaw Quirt is quite similar to Wayne's breakthrough role as the Ringo Kid in Ford's masterpiece, Stagecoach (1939). That film made Wayne a huge star, and it also established and defined the Western genre for decades to come. The Angel and the Badman turns the gunslinger myth on its ear by having Quirt, who has now converted to the Quaker faith to please his lady love, show up for the final gunfight without a weapon. 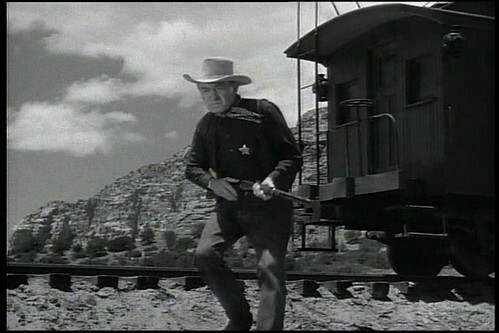 Legendary Western actor Harry Carey plays Marshal Wistful McClintock in The Angel and the Badman (1947). Wayne had been Republic Pictures biggest star for almost a decade when he made The Angel and the Badman. Wayne was itching to have more control of his own films, so Republic allowed him to produce the film himself. Wayne hired Grant, who had only worked as a screenwriter, to write the original story and direct the film. Wayne also hired famed stuntman Yakima Canutt to handle the action sequences, which included a spectacular wagon chase over the scenic canyons of Arizona. Wayne placed top talent in front of the camera, including legendary Western actor Harry Carey, who plays Quirt's nemesis Marshal Wistful McClintock (this surely has to be one of the best character names in Western history). The Angel and the Badman was not a success on its initial release. Forties audiences were used to seeing Wayne as a man of action and this meandering and philosophical film frustrated moviegoers. Today, The Angel and the Badman feels like Wayne's forced attempt to imitate the style of his mentor Ford. The film has its highlights (the final gunfight sequence is quite suspensful), but it often gets mired down with pacing problems and unnecessary dialogue. The Angel and the Badman has gained a cult following through the decades. Johnny Cash was a huge fan, even writing a song about the film (above). There was also a Hallmark Channel remake in 2009 starring Lou Diamond Phillips. The Angel and the Badman is streaming on Hulu. It is also available on DVD. Next week we'll hit the range with the Duke in Chisum (1970).